Narelle Oliver Review: Fox and Fine Feathers is the tale of four native Australian ground birds who are on a continual look out for each other. This is a necessary cooperation, for each bird is a potential meal for one of the world's most successful and cunning predators: the fox. The tradegy is that the fox is not native to Australia, and, as Narelle Oliver states in the notes at the back of the book, the fox was introduced to Australia in 1855 for recreational hunting. The fox quickly became established in Australia as a highly effecient predator. In a little over 100 years the fox has preyed on many native Australian species of birds and small mammals. Many native animals during this time have become endangered, some species have been pushed to the edge of extinction. Fox and Fine Feathers features four native birds that live together in an Australian forest. The four birds are a nightjar, a lyrebird, a Pitta and a Coucal. Each bird is beautifully illustrated by Narelle Oliver and blends in well with the natural environment of the forest. In contrast, the fox is drawn in striking reds and browns and has pitiless yellow eyes that seem to glow. The text features many colorful passages that describe the birds as they move about in their environment. I've discovered that the book makes a lovely and highly useful introduction to figurative language for younger readers. Narelle Oliver makes abundant use of simile and metaphor to describe the birds' more flamboyant behaviour. For instance, 'The effect was dazzling. Pitta was a little bit of rainbow chirping and flickering in the forest shadows.' excerpt from Fox and Fine Feathers, by Narelle Oliver. 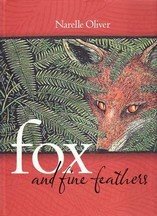 Fox and Fine Feathers is recommended for readers between 7 - 9 years of age.